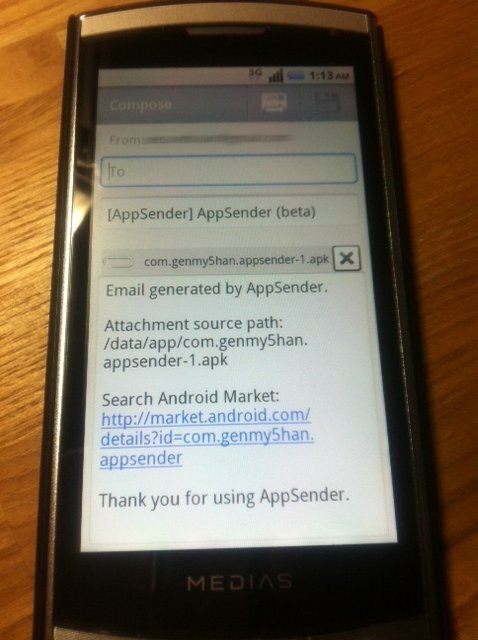 I just released AppSender BETA version 1.6 to android market. The new build (version 1.6) is now available on Android Market. Enhanced email message. Now includes link to Android Market to search for the app. Removed the annoying "Beta message" displayed at beginning of the app. Removed Beta license expiration time bomb. You can now use this app after Sept 1, 2011. If you have experienced any bugs, it would be greatly appreciated if you can contact me at moto.android.software@gmail.com. Please include as much information as possible to reproduce the problem. I will try my best to fix it soon as possible.